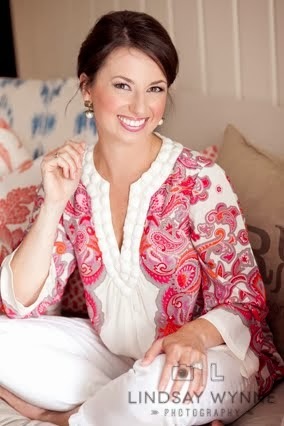 Partnering with one of my FAVORITE household supply companies for this post -- y'all know I love Grove Collaborative, and they make keeping a clean house just a little more fun for me! Spring scents from Mrs. Meyers are mint, lilac, and peony. The mint is calling.my.name. Partner links provided below will earn new customers some awesome freebies. But don't wait around too long, because this amazing deal ends SUNDAY! Lately, I've been drooling over all the bright, clean kitchens on Instagram. Even though a full kitchen makeover isn't in my budget, I've found some affordable ways to rediscover pride in my home, so I wanted to share them with you. 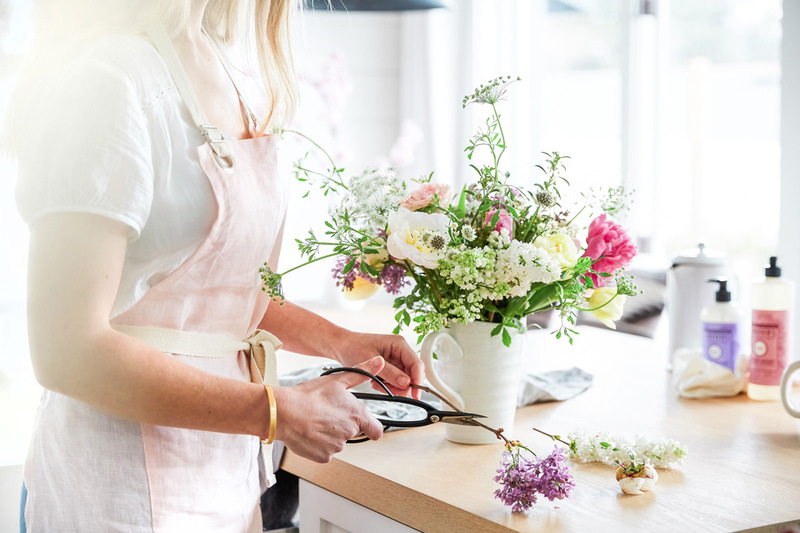 It’s amazing how something as simple as a good spring clean or a bouquet of fresh flowers on the counter can help you fall in love with the home you have — whether it’s a tiny apartment or your dream home. 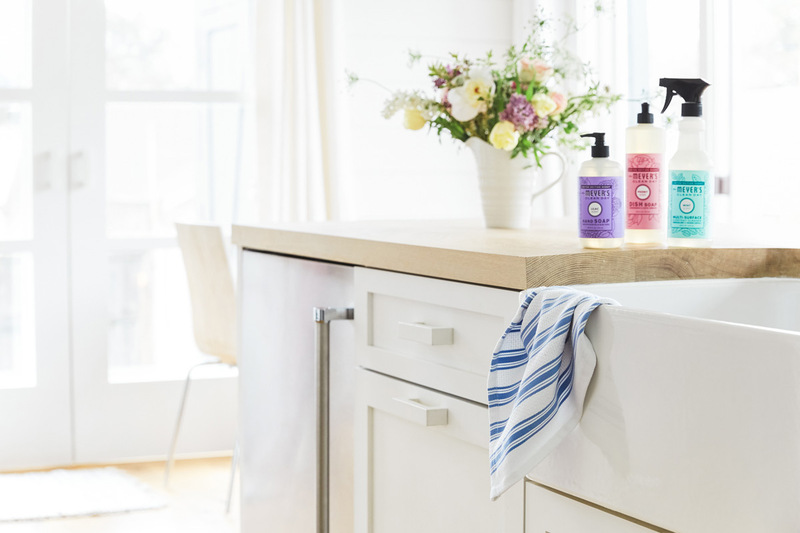 First, grab this free set of Mrs. Meyer's spring hand soap + dish soap + multi-surface spray + spring kitchen towel with your first order of $20 from Grove Collaborative. 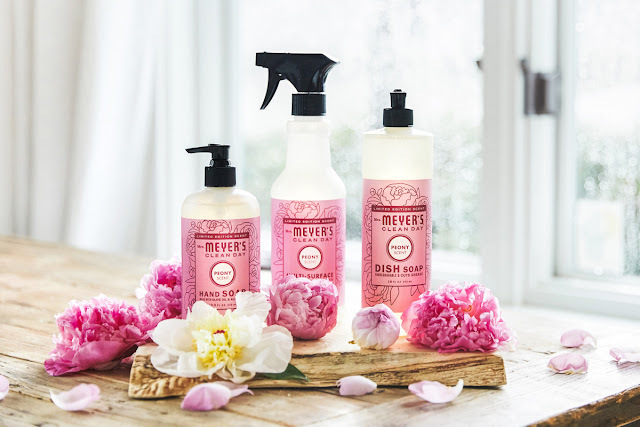 You can choose from three limited-edition Mrs. Meyer’s spring scents: mint, lilac, or peony. If you're already a Grove customer, you'll receive free Grove walnut scrubber sponges. Spending $20 to get this free bundle is easy -- go ahead and stock up on Mrs. Meyers laundry detergent (we are currently using Lavender but I also looooove their Honeysuckle scent) because goodness knows you'll be needing that anyway! Step 2: Start with a clean slate. 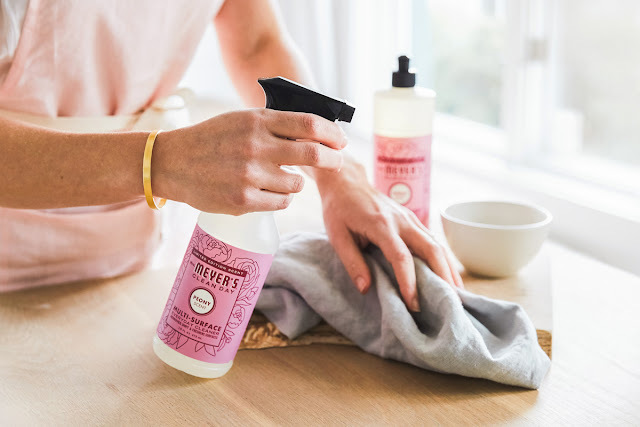 Mrs. Meyer's multi-surface spray makes quick work of cleaning appliances, the inside of the fridge, countertops, and backsplashes. Plus, it leaves your kitchen smelling like a spring garden! Step 3: To get your pots and pans ready for new spring recipes, make a paste with Bon Ami and water and apply it all over. Let it sit for about 10 minutes, then wipe away those scorch marks with a sponge. I prefer Grove's walnut scrubber sponges because they don't scratch your cookware! Step 4: The sink is probably the most used area in your kitchen, but gets the least love when it's time to clean. Grab the Bon Ami again and sprinkle it on your sink and faucet, rub with a wet cloth, and then wipe clean. To freshen up your garbage disposal, squirt Mrs. Meyer's dish soap into the disposal and run the disposal with hot water. The mint scent is especially good for neutralizing odors. Step 5: Just like a statement necklace can make an old outfit feel new, sink-side accessories can totally transform your kitchen. I love Mrs. Meyer's hand and dish soaps because they add a pop of cheerful color to my kitchen and smell amazing! I keep mine on a little white ceramic rectangular tray. Step 6: Treat your kitchen to a fresh new towel in a spring color. I consider the Grove chef's towels an essential, since they work for everything from wiping hands, to drying spills and dishes, to grabbing hot pans. The cornflower blue color is brand new, and you'll be among the first to get one. Step 7: Trick your guests into thinking you redecorated with strategically placed accessories like a bamboo cutting board, a wooden handle dish brush, or a stoneware tray. Little, fresh accessories can pack a punch. Step 8: Of course, you can never go wrong with cut flowers. Daffodils and hyacinth are currently on our kitchen island. Hyacinth smells SO good and I haven't been burning a candle recently because of how fragrant it is! Bonus tip: I'm a huge fan of Grove Collaborative because they help me create a healthy, beautiful home I can feel proud of. When you submit your first order using my link, you'll be signed up for the free 60 day VIP trial. For 60 days, you'll save even more with free shipping, free gifts, price matching, exclusive sales and personal service. I hope you will check out one of my very favorite earth-friendly companies. Grove Collaborative does it right! I got the mint dish and hand soap on my last order, and it smells SO good. It's the perfect sweet mint fragrance! Will have to stock up on it before the season's over! I just placed my first order can't wait for some spring scents. Fun! The mint smell sounds so fresh and happy for spring.